Sign up for breaking news alerts from the Times-Standard and get access to your local news on our newly updated mobile app. The app offers all of the stories our reporters publish on our website and in the print newspaper, but in a quicker and scrollable platform. It’s available for both iPhone and Android users. iPhone users: Click here on your mobile phone to download the Times-Standard app or search “Eureka Times-Standard” in your app store. 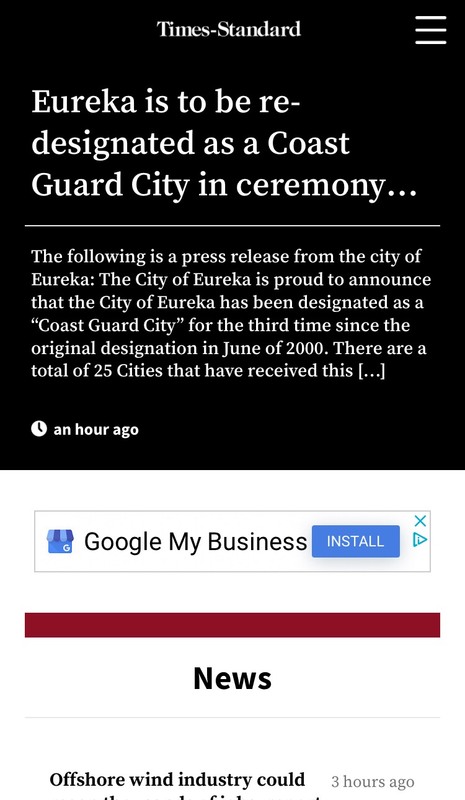 Android users: Click here on your mobile phone or search “Eureka Times-Standard” in your app store. Here’s how to refresh and access the new features if you downloaded the app before August 2018. • Close your Times-Standard app. For iPhone users, you will need to double-tap the home button and swipe up on the app to close. Android users can swipe up to the middle of your screen, then swipe up on the app. • Scroll all the way to the bottom of at least five stories. This will ensure you can receive breaking news alerts. Go to your phone Settings > Notification Settings > Times-Standard app. Allow all notifications to receive breaking news alerts. Questions? Email social@times-standard.com for help.